Heat oven to 450°F. In bowl, place reserved strawberry juice. In another bowl, mix 1/3 cup granulated sugar and the cornstarch; using whisk, beat into reserved strawberry juice. Stir in strawberries and rhubarb. Remove pie crusts from pouches; unroll on work surface. Using 3 1/2-inch round cutter, cut out 16 rounds (8 rounds per crust). Place 8 rounds on ungreased cookie sheet. Spoon strawberry-rhubarb mixture evenly onto each round to within 1/2 inch of edge. Place 1 craft stick in filling of each. Flatten remaining rounds to 4 inches in diameter. Brush underside of each round with egg white; place over fruit. Press edges together; seal with fork. Cut small slit on top of each. Brush tops with egg white; sprinkle with 1 teaspoon sugar, dividing evenly among pops. Bake 10 to 13 minutes or until golden brown. Remove from cookie sheet to cooling rack; cool 10 minutes before serving. Mix powdered sugar and milk until smooth, adding milk until thin enough to drizzle. Drizzle over pops; let stand until set, about 30 minutes. 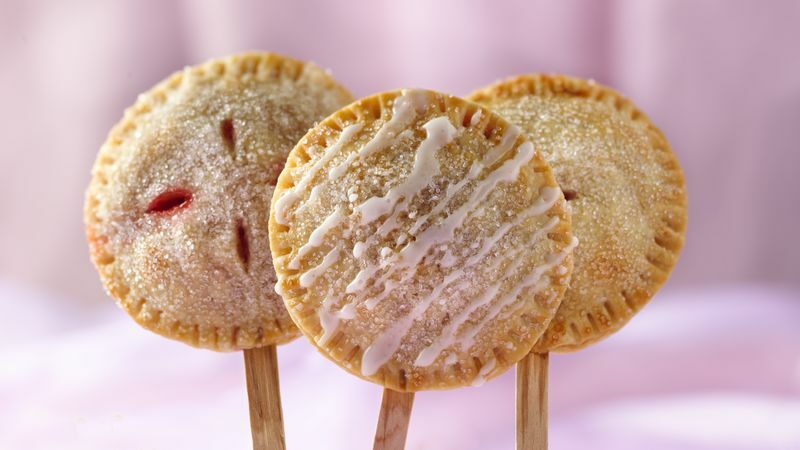 If desired, replace the strawberry-rhubarb filling with 1 cup of your favorite canned pie filling--cherry, blueberry or apple.